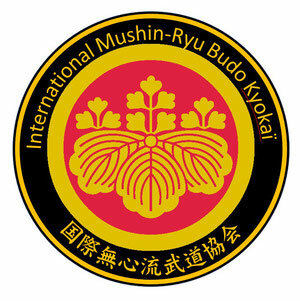 Shito-Ryu - Site de goshinkaratedo ! Shogo Kuniba was the head of the Motobu Ha/Kuniba Ha Shito Ryu, Seishin Kai Karate Union, headquartered in Osaka, Japan. Since the IKKU grew from Seishin Kai and later from the NKJU, it is important that we know something about him. Shogo Kuniba was born at Fugi-Yoshida City, Yamanashi Prefecture, on February 5, 1935. His father was Kosei Kokuba (Japanese/Kuniba), who had studied karate with Choki Motobu and others. In 1940, the older Kuniba opened a karate dojo in Osaka. It taught the Motobu Ha Karate Do and was called later, the Seishin Kan dojo. Shogo Kuniba began his karate study at his father’s dojo that same year at the age of five. Kenwa Mabuni and Ryusei Tomoyori who taught there in return for room and board joined the dojo. 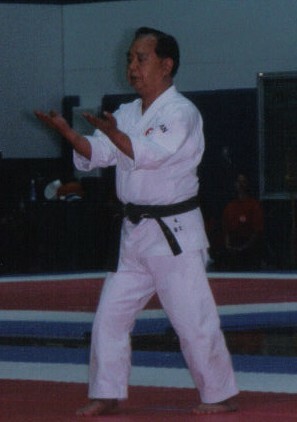 Mabuni sensei is the founder of Shito Ryu karate. By 1947, after the hardships of the World War, Shogo Kuniba achieved his black belt. He was awarded his shodan by Master Mabuni. After three more years of study, he earned his nidan from Master Mabuni and Tomoyori at the age of fifteen. In 1952, he was promoted to sandan by Master Mabuni and began to diversify his studies. He went to Sakai City where he studied Mugai Ryu Iaido with Soke Ishii Gogetsu. In 1955, at age 20, after fifteen years of study, he earned his yandan from Master Mabuni. In that same year, he went to Naha City, Okinawa, where he began training at the Matsubayashi Shorin Ryu dojo of Master Shojin Nagamine. While in Okinawa, Soke Kuniba undertook serious study of kobudo. With Master Shojin Kosha, he studied the use of the bo and nunchaku. With Master Junko Yamaguchi he studied the tonfa. By 1958, Shogo Kuniba had achieved 5th Dan in Motobu Ha Karate Do, 4th Dan in Iaido, 6th Dan in Kobudo and been awarded the position of first office manager for the Zippou Karate Do Rengokai. He was 23. But not all went well for Master Kuniba. On October 17,1959, his father, Kosei Kokuba, died. Shogo then became Soke for Motobu Ha Karate Do by secession. In 1962, Soke Kuniba was promoted to 6th Dan in the Nippon Karate Do Rengokai, 6th Dan in Iaido and 7th Dan in Kobudo. In 1966 he became 7th Dan in Karate. In 1968, he relieved Shihan Teruo Hayashi as the head of Seishin Kai. By 1973, at the age of 38, Soke Shogo Kuniba had achieved 8th Dan in karate, Iaido and Kobudo. He was the youngest Master to have won such prestige. His career has also included many other achievements, including his 1978 appearance in a classic demonstration on Japanese martial arts. In 1983, Soke Kuniba moved his base of operations to Portsmouth, Virginia where he opened the USA Honbu Dojo. There he concentrated his efforts on spreading his style of martial arts throughout the world. In 1984, the Rengo Kai promoted Shogo Kuniba to the rank of Kudan in karate. At that time, he held the highest rank of any Japanese martial artist living outside Japan. On July 14, 1992, Soke Shogo Kuniba died of stomach cancer, but before his death, he had renamed the Motobu Ha system to Kuniba Ha Shito Ryu. After his death, he was awarded Judan (10th dan) by the Japan Karate Federation. This was a final tribute to one of the most highly esteemed masters of the martial arts in the world. L'enseignant du CKT La Vanaude a connu le Maitre Kuniba au début des années 1990 puis a travaillé ensuite avec son successeur Kunio Tatsuno. Il est correspondant et reconnu dans ses grades par l'International Karate Kobudo Union (Osaka, Japon). Frédéric Masseix est officiellement le plus ancien instructeur du Seito-Shito-Ryu en France, seul reconnu par la Fédération Mondiale International Karatedo Kaï depuis 2000.